At all times, we reserve the right to disclose any information, including personally identifiable information, to comply with any applicable law, regulation, legal process or governmental request; to protect Annie Hewitt rights or property (including without limitation in the event of a transfer of control of a Annie Hewitt company, affiliate, or brand, or substantially all of its assets), or during emergencies when safety is at risk, or for credit fraud protection and risk reduction purposes. This Website is intended for adults. We do not knowingly collect personal information from children under the age of 18. However, if the parent or guardian of a child under 18 believes that the child has provided us with personally identifiable information, the parent or guardian of that child should contact us using our contact form, if they want this information deleted from our files so that it is not in retrievable form. If we otherwise obtain knowledge that we have personally identifiable information about a child under 18 in retrievable form in our files, we will delete that information from our existing files so that it is not retrievable. Clear gifs are tiny graphics with a unique identifier, similar in function to cookies, and are used to track the online movements of Web users. Clear gifs are not tied to users’ personally identifiable information. We want to communicate with you via email correspondence only if you want to hear from us. When you purchase Annie Hewitt brand (owned by Annie Hewitt Pty Ltd), we may from time to time send you email messages describing new products, special offers, and great values. If for any reason you would no longer like to receive email messages from Annie Hewitt, you can contact us using our contact form. Please allow up to 10 days for us to process your request. Your privacy is important to us, and for this reason we will never share or sell your email address with any third parties for direct marketing purposes. Please note, if you decide not to receive marketing emails from a Annie Hewitt brand, you may still receive “Transactional” email messages regarding your order (i.e. order confirmation, shipping information, customer service notifications, etc.) If you have questions or concerns regarding this statement, please contact us using our contact form. FLATTER TUMMY IN 4 WEEKS OR YOUR MONEY BACK! GUARANTEED! Rush me my pack Now! 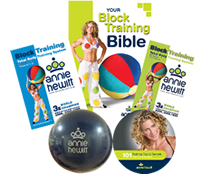 Subscribe Now to receive a link to your FREE streaming Video of my successful ’Block Training Resistance Workout’ as well as my Annie Hewitt Newsletter packed with freebies and goodies.